Thu., Feb. 22, 2018, 2:14 p.m. Cost: $25-$30. Tickets available through Ticketfly. Fans of the Travelin’ McCourys might have been a little worried when an article titled “Rob McCoury Taking Sabbatical From The Travelin’ McCourys” appeared on the live music-oriented website JamBase in August. “There’s a paper umbrella and a world of knowledge in my future,” McCoury is quoted as saying in a statement. The article went on to say that McCoury’s return date had not yet been announced. Turns out, fans had nothing to worry about as McCoury, the youngest son of legendary bluegrass musician Del McCoury, and his wife had just skipped away to Hawaii for the weekend to celebrate their anniversary. “It got a lot of traction,” McCoury said with a laugh during a recent interview before a show in Charleston, South Carolina. Since reuniting with his Travelin’ McCoury bandmates – brother Ronnie McCoury (mandolin, vocals), Jason Carter (fiddle, vocals), Alan Bartram (bass, vocals) and Cody Kilby (guitar, vocals) – McCoury, who plays banjo and sings, and the band have been hard at work both on their own and supporting the eldest McCoury as his backing band. An offshoot of the Del McCoury Band, the Travelin’ McCourys formed in 2009 at the suggestion of Del himself. The band had thought about its post-Del McCoury Band career but not too seriously. For one, the band stays pretty busy traveling with the elder McCoury, which makes it difficult to carve out time to learn new material and hit the road. But over the years, Del has made time in his schedule to allow the Travelin’ McCourys to build a following of their own. Though the lineup of a Travelin’ McCourys show is nearly identical to that of a Del McCoury Band show, with the addition of Kilby, McCoury said the band approaches their own shows a little differently than shows with his dad. The band has its own collection of songs, many of which are longer than the bluegrass tunes they play with the Del McCoury Band. Plus, they usually plug in their acoustic instruments, resulting in a louder show. 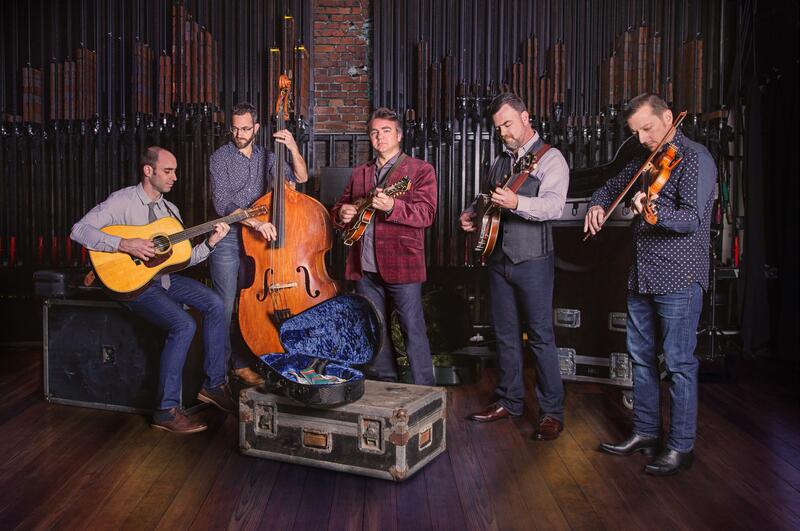 After nearly a decade together, the Travelin’ McCourys is preparing to release its debut album, which the band is currently recording at country-folk singer-songwriter John Prine’s Butcher Shoppe Recording Studio in Nashville. The band released a split EP with the Lee Boys, “Meetin’ in the Middle,” in 2011 and an album in collaboration with Keller Williams called “Pick” in 2012, but this album, which the band hopes to release in May, marks its first official release as the Travelin’ McCourys. McCoury said the band’s previous singles will appear on the album as well as newer songs written by members of the band. Taking after the McCoury patriarch, the Travelin’ McCourys aren’t ones to slow down. The band is also working on a new record with the Del McCoury Band and will perform at the 11th annual DelFestbluegrass festival in May in Maryland. But before that, the band will tour the West Coast, including two shows at the Bartlett on Wednesday. “It makes for a long night, but sometimes that’s what you’ve got to do,” McCoury said. Published: Feb. 22, 2018, 2:14 p.m.